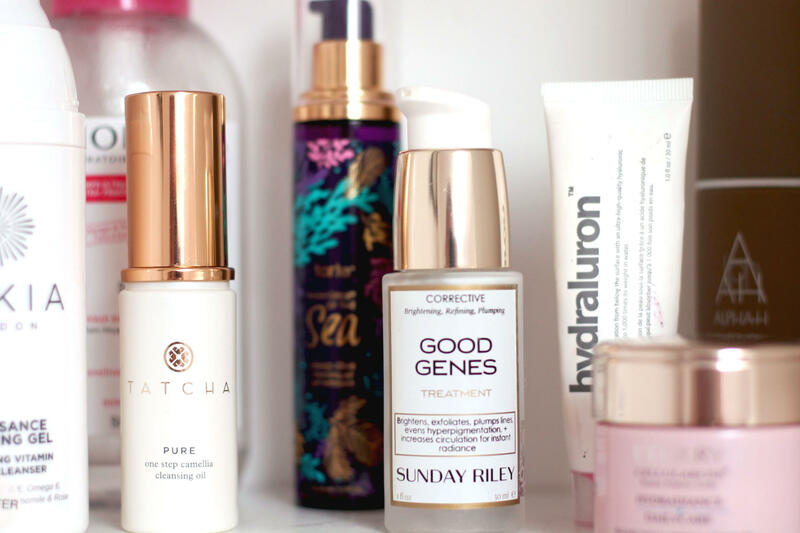 I’ve not done an updated skincare routine post in a while, so here is a little round up of my morning and night time skincare favourites. I have and try a lot of skincare, however its not until recently that I’ve seen a difference with my skin and i’m somewhat happy with my routines. I have dry to normal skin with pigmentation and scaring. My main concerns are my scaring and redness. To remove eye makeup, Bioderma is a cult classic, it removes eye makeup easily and effectively. The Oskia Renaissance Cleansing Gel has been a favourite of mine for years, I use it as part of my double cleanse, the gel to oil cleanser is moisturising and hydrating. I use this cleanser duo every night to remove makeup. In the mornings I reach for Tarte Rainforest of the Sea Deep Dive cleansing gel, it has a lightweight formula and contains vitamin C which helps to brighten the skin. I use two different serums daily, to target different areas. Kiehls Clearly Corrective Dark Spot Solution is amazing for brightening the skin, lifting dark spots and also hydrating the skin. I use this over my cheek area. For added hydration I have been using Indeed Labs Hydraluron Moisture Serum for about 3 years now, its a gel consistency which contains a pure form of hyaluronic acid. I use this around my temples and jaw line. I have a couple of moisturisers on the go that I’m trying out. My favourite so far has been Tarte Drink of H2O Moisturiser, this is a gel formula, which I prefer for my dry skin. I use this as a base before makeup, it acts as a glow-giving primer with extra hydration and glow. An old fave, By Terry Hydradiance Daily Care I use this one during the day and sometimes at night if I want an extra hydration kick. This also has a gel consistency which is lightweight and ideal for under makeup also. For eye cream I like to keep things simple, lifting and smoothing. I’ve been using By Terry Liftessence eye cream everyday, I sometimes use my beauty blender to apply this under the eye. Once or twice a week, depending on what my skin needs I will use a selection on exfoliators, acid peels and creams. I mix Tatcha Pure one step camellia cleansing oil with Tatcha Polished classic rice enzym powder, this creates a gentle exfoliator, I use this mostly over my cheeks and nose area (where ever I have texture), its leaves my skin really smooth and polished. I have a lot of scaring and and redness on my cheeks which I am constantly trying to get rid of. I recently tried the Alpha H Liquid Gold, this is a powerful overnight serum which gradually reduces scaring, redness, fine lines etc. I have seen the biggest different in my skin recently and I think it’s down to this serum (this can sting the skin but that die downs after a couple of minutes). Good Genes by Sunday Riley is a new product for me, I know I’m late to jump on the bandwagon here, but its never apealed to me before. This also helps to reduce scaring, hyper-pigmentation and wrinkles, this product can also be used as a mask. I use these products alternatively once or twice a week. I never use these treatments together it all depends on how my skin is behaving and what I want to treat. 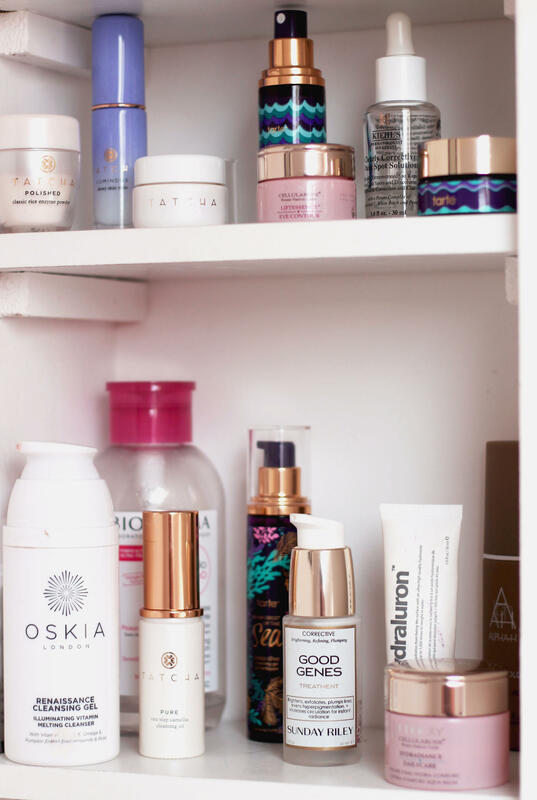 What are your current skincare picks?